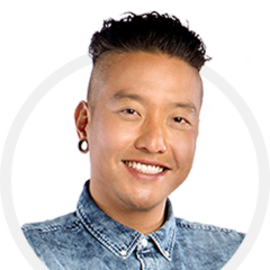 Chris Oh burst into the public awareness when he won Season 3 of The Great Food Truck Race. Shortly after winning, he opened the popular Seoul Sausage restaurant in Los Angeles where crowds clamor for his galbi poutine, Korean fried chicken, and fried balls stuffed with things like kimchi fried rice and ginger mayo. But he’s no longer merely a fixture in the open kitchen at Seoul Sausage. He’s now splitting time between a number of other ventures, like the restaurant Escala, where he developed a Columbian menu (that some Columbians say is as good as home), and Good Times BBQ where he has given new meaning to a Sunday afternoon kick back. Most recently, Chris did an overhaul on the concession stand at the Los Angeles’ famed Chinese Mann Theater. Chris has won Food Network’s Cutthroat Kitchen and Esquire’s Knife Fight. He was also a regular chef on Food Network’s Kitchen Inferno and a judge on FYI’s Late Night Chef Fight. Soon he’ll be judging competitors’ dishes on Bravo’s new show, Recipe for Deception. Chef, Author & Host of "Avec Eric"
Host of "The Cake Boss" & "The Next Great Baker"